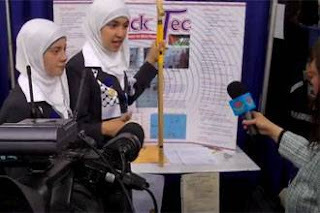 The 14-year-old girls, Aseel Abu Aleil, Aseel Alshaar and Noor Alarada, took their prize for a prototype walking cane for the blind that "beeps" to alert the user of drop-offs and obstacles. 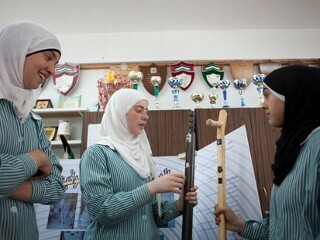 The girls were the first Palestinians to participate in Intel's international youth science fair. "Unlike other electronic canes that send an infrared signal forward, the girls’ invention has a 'seeing' sensor below that beeps when the surface changes, such as near stairs, holes or water, up to 30 inches away," the UN report said. The girls received high praise from Secretary-General Ban Ki-moon when the met the leader at UN headquarters in New York. "This is a story about brain power not fire power. You are not only helping the blind, but helping the world to see," Ban said. "I am very impressed by your brilliant idea. This is the truth that I repeat every day. By empowering women, we can achieve anything in the world." Abu Aleil came up with the idea for the cane after seeing her blind aunt and uncle navigate the steep hills of Nablus. Abu Aleil built the cane with Aseel Alshaar and Noor Alarada. Fashioning the cane was no simple task after the science and theory - locating the spare parts in the West Bank was difficult, and gathering them from Israel was not much of an option given the travel restrictions faced by Palestinians. Still, they were able to build two prototype canes after several trips to Ramallah, which meant braving two Israeli checkpoints, to hunt for the circuits and sensors in electronics stores. Obstacle-detecting canes are nothing new - so-called "laser canes" have been around since the 1970s. But the girls' cane resolves a flaw found in previous canes, according to the American Federation of the Blind's technology division director Mark Uslan, as their cane detects holes and drop-offs. The girls returned to Nablus with $250 in each of their pockets and plans to "have a big party," the UN report said.